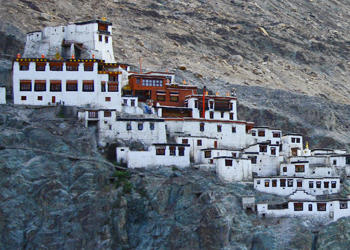 Diskit Monastery, also known as Diskit Gompa is the largest and the oldest surviving monastery in Nubra Valley. The Gompa was founded in 14th century by Changzem Tserab Zangpo, a founder of Gelugpa sect of Tibetan Buddhism in Ladakh. The Monastery stand tall on a hilltop above Shayok River and affiliated to famous Thiksey Monastery. There is a statue of Cho Rinpoche (Crowned Buddha) in the prayer hall along with various images of fierce protector deities and it also possesses Tibetan and Mongolian texts. The main attraction of Diskit Monastery is a gigantic 32 metre Maitreya statue of Lord Buddha on its top which was inaugurated by His Holiness Dalai Lama. The Gompa offers stunning views of Nubra valley from its top where statue of Buddha is also mounted. The monastery also runs a school for the Tibetan children in the region with the help of Tibet Support Group, a social organization. A festival known as the “Festival of the Scapegoat” is also celebrated here in February which is mainly attended by local people from villages of Nubra Valley because the other regions of Ladakh are not accessible during this period due to heavy snow fall.